In just two weeks, I had five overwhelming art experiences, each of which, in their own way, brought me back to the theater. 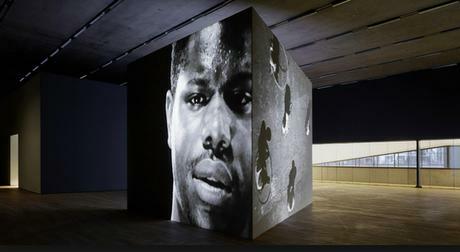 The first was the exhibition of Steve McQueen’s work in Schaulager, near Basel. I was in Basel for a conference and had only a few hours to spare. But thanks to my host, Martin Sundberg, I had the good fortune of being able to see this fantastic show, a few hours before the venue opened to the public. Martin had put me in touch with Stephan Hauser, librarian of the Schaulager museum, who generously toured me around through the exhibition. It was a great pleasure to share my enthusiasm about McQueen’s work with this knowledgeable man. McQueen, who is currently working on his third feature film, has a large body of work in video, and also photography. 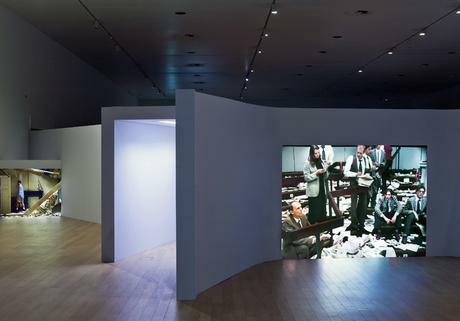 The exhibition at Schaulager is beautifully installed, giving great insight into the work beyond the images alone. In the first gallery, for example, three of my long-term favorites are placed together. His classical Bear from 1993, showing an ambivalent fight/love between two men, is projected on a triangle with, on the other two sides, Five Easy Pieces (1995) and Just Above my Head (1996). Other works are placed alone in the dark, to enhance the somewhat claustrophobic effect of extreme close-ups, as in Gravesend (2007), or the haunting 7th November (2001). The design of the exhibition enhanced the theatricality of many of the works, different as they are otherwise. Then, I went back to the fantastic exhibition of Aernout Mik at the recently reopened Stedelijk Museum. I went for the third time, spent three hours, and still feel the desire to go once more. Moving images of collapse (Middlemen), of people laughing and crying (3 laughing and 4 crying), teenagers being bored, or being or playing dead (School Yard). 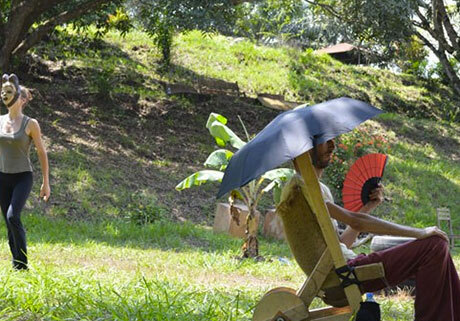 In the video installations of Aernout Mik, things happen but there is no outcome. There is motion, commotion, and emotion; hence, narrative, but without conclusion: no story. Nor can one identify with central figures. The experience of this exhibition is unsettling and, in my view, profoundly empowering. I wrote a short article about it for Art in America. Both McQueen and Mik were closely involved in the installation. Mik even designed it himself. Walking through the labyrinthine space feels a bit like participating in a theatrical play. As a visitor, your body’s shadows fall on the images, installed low. And then, the theater in a more literal sense came back into my life. For the first time in decades, I feel completely fascinated by the theater again. After seeing the French Henri VI (see the post of April 14th) and Schéda in Amsterdam last week (see the post of June 9th), so different, yet both so exuberantly alive that I strongly experienced the special effect of live performance, this week I saw Desdemona. I am not sure how to call this - a play, an opera, a performance, a concert? Never mind the term. It was deeply and literally wonderful. If you cannot see it, at least get the book. American writer and Nobel laureate Toni Morrison has taken up the under-illuminated character of Desdemona, who, in the Shakespeare play, is murdered in a jealous rage by her husband Othello. Morrison gives voice to Shakespeare’s silent women. The poetry Morrison wrote is recited by Tina Benko in a beautiful, under-stated voice, modulating to incarnate the voices of other characters, such as Iago’s wife Emilia, who is guilty by silence; she could have saved Desdemona but failed to speak. This theme of guilty silence forcefully updates the age-old Shakespeare play. 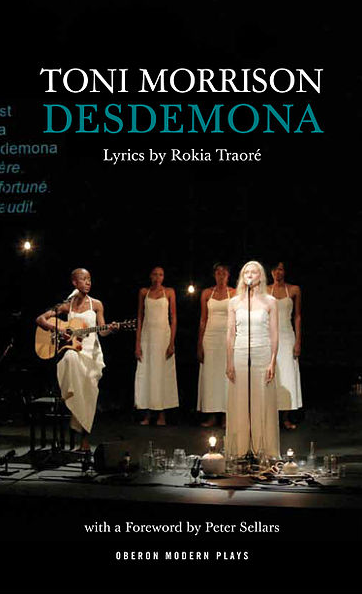 The Malian musician Rokia Traoré composed brilliant songs (for which she also wrote the lyrics) to establish a dialogue with Desdemona. She gives a life to the character who, in the play, is a name only, and a false one at that: Desdemona’s childhood nurse, mis-called Barbary. This (non-)name brings into the Shakespeare play a second African character, now fully developed by Traoré’s brilliant songs. The alternation between song and recitation is both dialogic and discrepant, which renders subtly the (mis)communications between the African woman and the Venetian one. “You don’t even know my name”, says “barbary” when Desdemona, in the afterlife, begs for her affection. While the beauty and power of this performance was still whirling through my head, two days later I saw a small exhibition in the Paris gallery Kamel Mennour, with works by Ann Veronica Janssens. Perhaps because of these recent theatrical experiences I was struck again by the way Janssens’ subtle and silent artworks stage the viewer, give her a task: without an engaged, bodily activity, the works don’t give up their secret magic. Two works especially got to me. 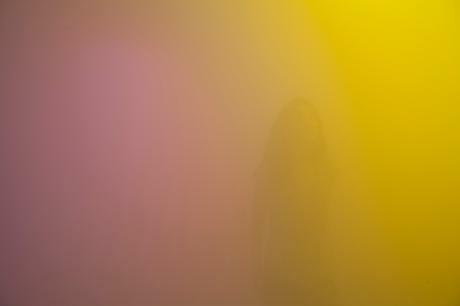 In spite of having seen a good number of versions of her famous colored mist rooms, this one, called Fantazy was more powerful than any I had seen before. No photograph does justice to the intensity of the experience to see strictly nothing, yet being immersed in intense colors. These change when you move through the space. Perhaps due to the natural light coming from the ceiling, the work worked, so to speak, more forcefully than ever. The close proximity between theater and sculpture illuminates for me the importance of liveness in the experience of both. Next week my two books on the political force of contemporary art are scheduled to appear. One of those is devoted to Janssens’ abstract work, the other to Eija-Liisa Ahtila’s video installations. Mathieu Montanier, our actor who played Fool #1 in A Long History of Madness and who plays Homais in Madame B., was briefly in Amsterdam. 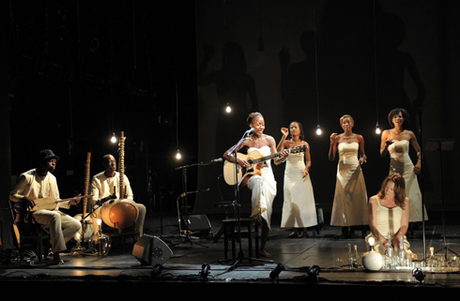 The Holland Festival had programmed Shéda, a turbulent theatre “event” by Congolese linguistic virtuoso author Dieudonné Niangouna. The play, by Niangouna’s company Les bruits de la rue, is an apocalyptic group performance where people tell others whom they don’t know their experiences at the end of time. They fight, shout, dance, fall apart or simply fall down; they sink, drown, impale themselves, but they never die. Are they gods, forgotten, myths, fallen heroes, the dust of failed loves? They are there, in Kakuma, the Swahili word for “nowhere”. They live in a time that, as one of the characters says, varies when no one worries, and stops moving when the people go elsewhere, as in the theater. Shakespeare is never far away! Mathieu plays an old man who has remained a child, tries to impale himself, and fights like the rest and the best.. This huge production took Mathieu to Congo, à Brazzaville, for rehearsals. In this photo you see him during one of those. We took advantage of his presence in Amsterdam to shoot a short epilogue to our film. We had discovered after the fact that Flaubert had written an ending to his novel that stages Homais in a psychotic crisis, where he doubts his own existence. This was too good to be true: a postmodern Flaubert. In addition, this converged beautifully with the interpretation of the character Mathieu had intuitively produced. That, I am learning through these projects, is the genius of actors of this caliber. They put in more than we foresaw when writing the script, and retrospectively, they turn out totally right. 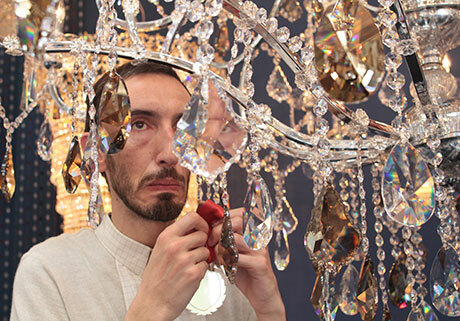 So, we had to stage this, and chose the chandelier store Crystolight in Amsterdam to put Mathieu among the reflecting crystals. It was, as always, a wonderful performance. Here, you see him in that mad situation. He is looking at the medal that has just been awarded to him, that “croix d’honneur” he had aspired to for so long. now that he gets it (Flaubert’s final sentence in the novel as published) he is completely falling apart (as per that unpublished ending we found). We had asked my long-term friend and former colleague Aart van Zoest to read a few lines Flaubert wrote, because we needed a voice distinct from Homais’. 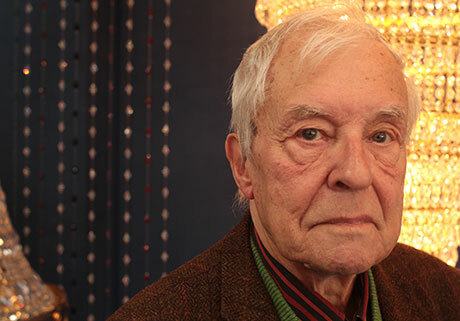 Aart is emeritus professor of French and a specialist of Peircean semiotics with whom I had collaborated a lot. The epilogue will be very short, but, we think, it adds another layer to the hysteria Mathieu has given to Homais’ character.